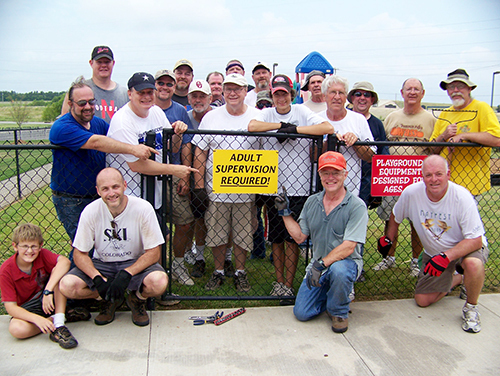 United Methodist Men gather after completing a recent work project for Owasso-First UMC. Owasso-First UMC is among the first churches recognized for growth by a new program of The Foundation for Evangelism, affiliated with the denomination’s General Board of Discipleship. According to a Foundation survey of attendance patterns in thousands of UMC congregations, Owasso was among those that experienced the fastest growth: 20 percent or more in five years. Attendance at the church in Bartlesville District is averaging 500 people. An interview with Pastor Chris Tiger was featured in "Celebrating Vibrant Churches," an online resource by the Foundation, offered to connect United Methodists with creative, successful evangelism practice ideas. In September, the Owasso Progress also published Rev. Tiger’s insights. He began serving First Church in June 1998. Due to its growth, the church relocated to a new site about five years ago. Along with the attendance growth, it has had a corresponding increase in staff, programs, and ministries of every type. Spotlighted here are portions of the interview with Tiger. HAVE A SHARED VISION. Your young men shall see visions, and your old men shall dream dreams (Acts 2:17). When Tiger was appointed to Owasso, the church already was engaged in a process called Revision, which had been recommended by the Oklahoma Conference Board of Church Development. The church took this very seriously and became unified about the vision that was developed. There is great power in a shared vision. MAINTAIN THE UNITY. Make every effort to maintain the unity of the Spirit (Ephesians 4:3). A prayer group developed that met weekly to pray for the church, the upcoming changes, and the construction process. We included as many people as we could in the planning of the new facility. We communicated often about the problems and the victories along the way. Sermons were preached to prepare people for what was to come. DEVELOP A SERVANT’S HEART. Whoever wishes to become great among you must be your servant (Mark 10:43). Emphasizing that we are all servants of Jesus Christ has helped our church reach out. We have a great reputation in our community as a church that helps others. We do not have volunteers in our church; we only have servants. BE WELCOMING AND GRACIOUS. Welcome one another, therefore, just as Christ has welcomed you (Romans 15:7). We strive to be a place of grace, where people can come just as they are and receive a warm welcome. One of my gifts is the ability to recall names, and I use this gift to reach people for God. We want the culture of our church to reflect God’s kindness, love, grace, and mercy. REACH OUT TO CHILDREN AND YOUTH. Let the little children come to me (Matthew 18:14). The church showed its huge heart for children and youth by building a wonderful facility for them. We developed a great reputation in our community as a church who cares for kids. Our best ministries are aimed at reaching them. These are some of the things that have worked for us. I think they can work for you as well. The Foundation’s director of Church Relations, Kenneth Lambert, interviewed Tiger. The organization was founded in 1949 by renowned evangelist Harry Denman. At each Oklahoma Annual Conference, Denman Awards for Evangelism honor outstanding clergy and laity who transform lives in Oklahoma for Christ. Other Foundation programs also fully endow 13 professors at UM-related seminaries around the world, including the United States, Zimbabwe, Germany, and Russia.